"I am glad to know that you are working hard to expand the Krishna Consciousness propaganda in Boston. I may say that this practical devotion is the secret to understanding the Sastras. My Guru Maharaja used to say that for one who is not engaged in devotional service, reading all the books is simply like licking the outside of the honey jar. One who thinks the books is the thing is content in this way. But we should learn the secret to open the jar and taste the honey. 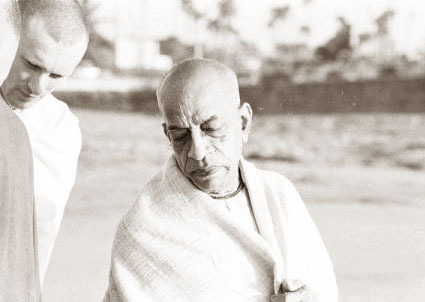 "In this way, if we can simply understand one book, or one sloka, the perfection is there. Lord Caitanya warned about reading too many books, although I see in America this is very popular to get volumes and volumes of books and not understand one. Anyway by sincerely working by carefully executing the instructions of the Spiritual Master, you will be all successful by Krishna's Grace."